It is already 1 year ago, Crufts 2014, Worlds largest dogshow, and it really is. Since 2005 I have been to Crufts and it is one of the nicest trips I make every year. But due to other reasons I'm not going this year. It makes me kinda sad, seeing all the happy facebookposts from people who go there but I have other fun stuff to do. Here is my last years Crufts adventure. It was a very interesting trip, because of economical crisis we could not go the normal way but we went in a rented van with 8 other enthouisastics and 1 dog. Normally this would be a touringcar with a touroperator, but this time not only the 8 doggeeks!! My trip started in Arnhem and along the way we picked up the rest of the group. When we where finally in Calais France my bud was already hurting very bad, but ok it was afterall my own idea traveling with this company. On our bus, kinda cool hey! 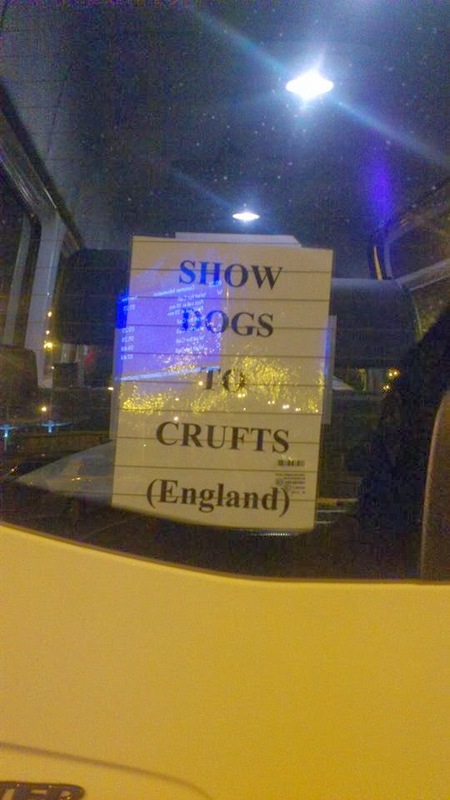 The English people ofcourse have invented dogshowing, (well did they??) anyway, they know how to host a dogshow. Crufts itself was great, a nice enty of 261 collies and we have been lurking around the colliering most of the day, I was so happy meeting such nice people I only see once a year, and I hope seeing them more actually. Then came the shopping part yay, it is amazing, dogpeople should go to Crufts once, if it was only for the shopping. I didn't even buy a lot of stuff, but in England they have some awsome products for dogteeth so that was a main goal for me. The main ring was also very great, we had an amazing spot, so for the first time we could see things very nicely, I was amazed by the great quality this year and I loovvveeeddd the Rotweiller winning the working group. In the pastoral group I was ofcourse hoping the Collie would win, but at the end it was the Samoyed who became reserve best in show on sunday. I had a great time in England and I'm looking forward in going again, only not this year.